The second variety of Cardissimo card cases offers the owner’s choice of three of the world’s most prized hardwoods. Keep Cardissimo carbon fibre business cards inside, for the perfect balance of warm tradition and the cutting edge. Hand-coloured engraving is also available. Cases are 62 by 100 millimetres, with a depth of eight millimetres. That’s space enough to hold the day’s business cards or credit cards, without spoiling the line of the pocket in which they reside. Effortless design allows one to remove a card with just one hand and a cool slide of the thumb. that will last as long as the impression it makes. Ziricote is prized for its dark and often purple-hued tones, “spiderweb” grain and natural resistance to decay. Found in Central America, Ziricote is a unique hardwood with very few imitators; an ideal material, therefore, for the CARDISSIMO Collection. The CARDISSIMO Hardwood Card Case in Dark Ziricote features an effortless new design that allows the holder to take out a card with just a slide of the thumb. Santos Palisander is a South American rosewood known for its remarkable strength and its range of rich red and brown hues. Its quality and exclusivity make it a natural choice for the CARDISSIMO Collection. 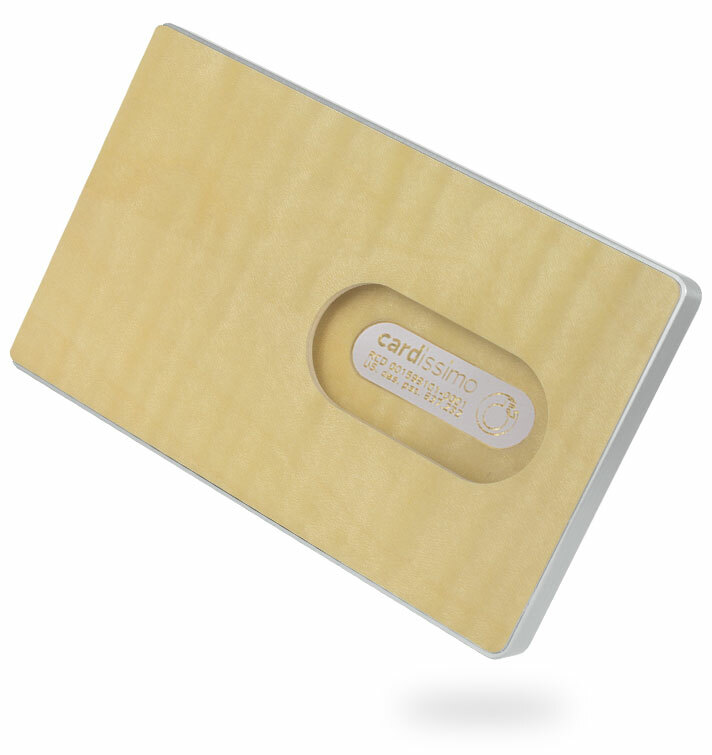 CARDISSIMO Natural Hardwood Card Case, Amazaque. Not Varnished – for original natural look and feel of the wood. 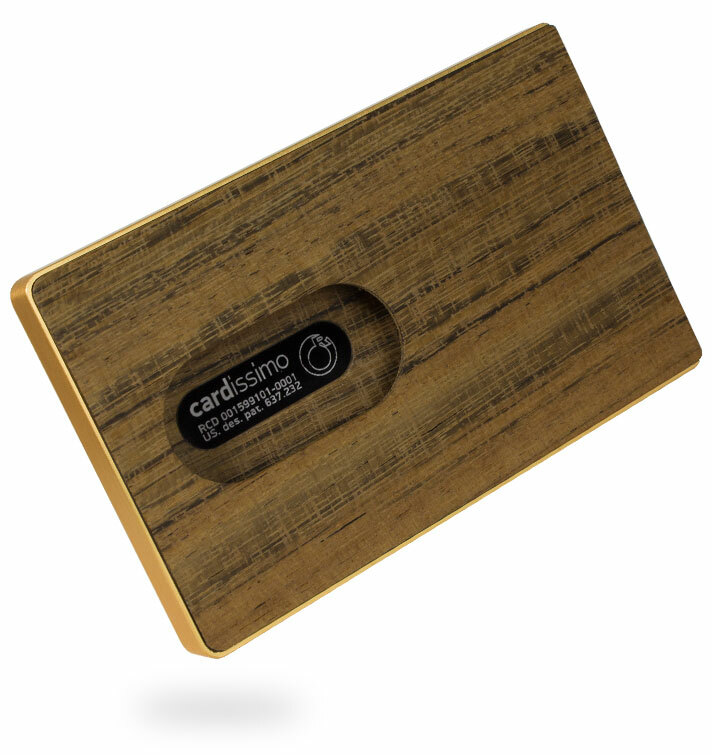 The CARDISSIMO Hardwood Card Case in Amazaque features an elegant new design that allows the holder to take out a card with just a slide of the thumb. The CARDISSIMO Hardwood Card Case in Walnut features an elegant new design that allows the holder to take out a card with just a slide of the thumb. CARDISSIMO Natural Hardwood Card Case, Smoked Oak. 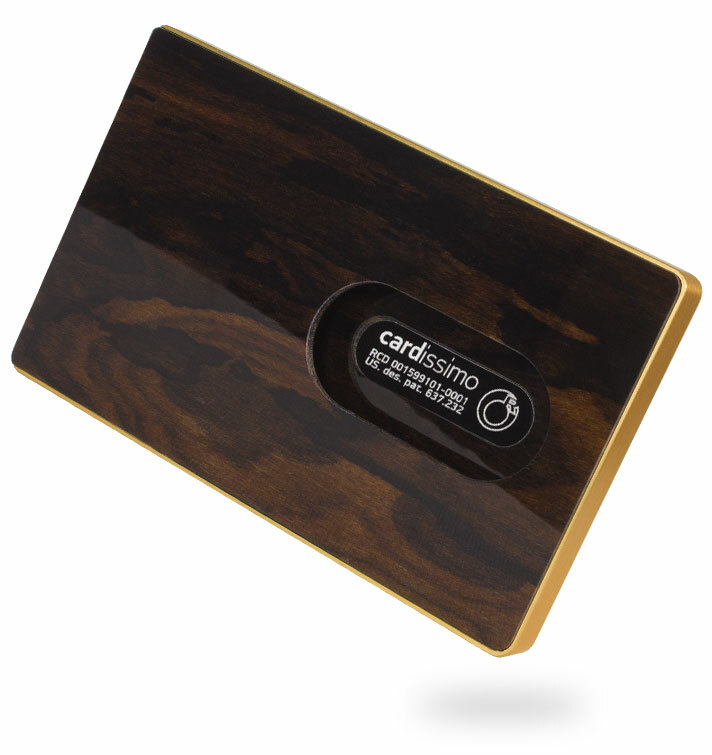 The CARDISSIMO Hardwood Card Case in Smoked Oak features an elegant new design that allows the holder to take out a card with just a slide of the thumb.